Over at the aptly-named Thoughtful Riot, Will Rutherford has been interviewing local social media creators to find out what makes them tick. Today he posted his interview with me. If you’re curious about when and how I started blogging and why I keep at it, go read and all will be revealed. If you’re a fan of hats, you can also see my lovely friend Julie wearing a spunky orange chapeau, and me wearing a hat that I don’t recall at all. 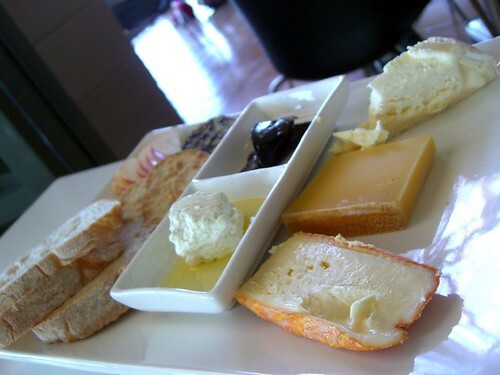 Green Point Room Cheese Platter with Tarago River Jensen’s Red Washed Rind Tarago River Triple Cream Brie-style, Exton Heidi Gruyere, Ewe and Goat’s Milk Feta, originally uploaded by avlxyz. Q: If you could have only one kind of food for the rest of your life, what would you choose? A: Well, first I’d say potato chips, because I’m completely addicted to them. But right away I’d see that this wouldn’t be the most wholesome choice, so I’d change it. I’d change to bread, but then I’d remember how grouchy I get when I have no protein, so I’d pick cheese. Q: That still doesn’t seem very healthy. A: What do you expect from a diet consisting of only one food? It’s kind of a dumb question. Q: It’s a hypothetical, for purposes of conversation. A: OK. Hypothetically, I’d pick cheese. Q: Any particular kind of cheese? Q: You seem very sure. A: Yes. Gruyere is a highly versatile cheese. You can eat it by itself, you can cook with it, you can grate it. It’s the cheese for fondue. It’s a key cheese. Q: You wouldn’t be cooking with it though. You would only be able to eat it plain. Q: I just want to make sure you’ve thought this through. A: OK, we’re done here.